Lou Marson is now with the team in Denver. Chris Coste will start tonight against the Rockies. And Carlos Ruiz will sit out, probably with a day-to-day sentence for a strained right oblique. I concur. The oblique strain is a notorious injury — it hangs around even when you don’t feel it, mainly because you’re constantly putting work on your abdomen. For Ruiz, whose job is to crouch and stand — putting his abs to work up to 200 times in three hours (not counting stress put on while swinging and running) — an oblique strain can really turn into something worse. 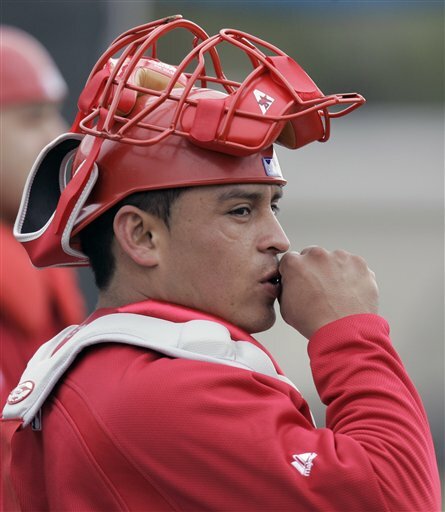 At this point — if the pain is real — it’s best to shelve Ruiz for 15 days and let him recoup without the strain of regular catching duties. The Phillies have depth at catcher, though it is quite limited once you pass Marson. Coste can handle the primary role.